Summary: Sea turtles once had no trouble finding a dark beach on which to nest, but now they compete with tourists, businesses and coastal residents for use of Florida's sandy beaches. Artificial lights from these developments discourage nesting female turtles from coming ashore to nest or cause female turtles to select less-than-optimal nesting sites. Additionally, hatchlings can become disoriented by coastal lights and often die from dehydration, exhaustion, terrestrial predation and passing cars. In 2009, over 53,000 sea turtle hatchlings were disoriented in Florida by artificial light pollution caused primarily by unshielded light fixtures and short wavelength bulbs on multi-family dwellings. There are many lighting solutions that can help darken nesting beaches, but beachfront property owners cite human safety and the cost of retrofitting lights as barriers to fixing problem lights. Data on disorientation events from the Florida Fish and Wildlife Conservation Commission suggest that there are between 700 and 1,000 private properties with problem lighting. In order to address this major threat to sea turtles and hatchlings, Sea Turtle Conservancy will conduct Project LIGHTS: Lighting Innovation for Greater Home and Turtle Safety, a public education initiative designed to dispel concerns about the safety and cost of sea turtle-friendly lights. Project LIGHTS will use traveling educational displays to ?show? 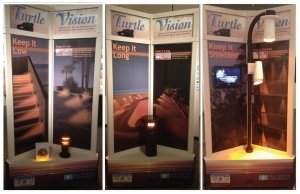 coastal residents and visitors how sea turtle-friendly lights can provide safety for both humans and turtles, while also providing a substantial energy cost savings for home owners. Visitor exposure for all locations where the display has been to date is over 250,000. All comments from the public and facilities have been very positive. Overall comments included "A beautiful display", "Lots of good information", and "A great lighting information tool". In addition, one of the facilities where the display was located, Gumbo Limbo Nature Center, has even secured funding to produce a permanent version of the display for their facility.